If you have a nut and dairy allergy humous is a real treat. Luckily for me I don’t have a sesame allergy but I have always been tempted to try making my own humous. How hard can it be right? Traditional humous contains sesame in the form or tahini paste and it does add the distinctive taste to humous. I have struggled to buy nut free tahini anywhere (those annoying may contain warnings) so I wondered, what would it taste like without the tahini paste? 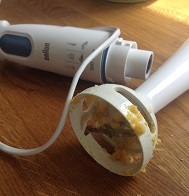 Before we start, I don’t have any fancy whizzy machines, just a hand-held blender, which was fine for the job though be very aware not to lift the blender while blending unless you like wearing humous! Dash of paprika to garnish. Or you could use parsley. Firstly drain chickpeas but remember to set aside the 3-4 tablespoons of liquid from the can. You might not need it all but it saves waste! 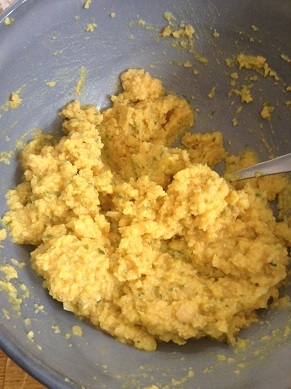 Roughly mix all the ingredients in a medium sized bowl then use your blender or food processor to blizt them into a paste. Add the liquid from chickpeas slowly and make sure it’s well mixed in for a few minutes. It should be a smooth paste. Or if you like it a bit more chunky, don’t whizz for as long. Then garnish with a drizzle of olive oil and a dash of paprika. My homemade humous seems to taste slightly different each time I make it but then that’s part of the fun. The amounts above are not set in stone, you can change quantities and add more spice or less depending on how it tastes. Some recipes add a bit more spice. You could try cumin, paprika, chilli or turmeric. You can add more or less than above and change to your own taste. Some recipes also add coriander but I am allergic to that so I almost didn’t let you know… Tastes fowl to me. Urgh! But most of all, have fun and experiment! The beauty of this humous recipe is that it’s now totally freefrom any allergens. No gluten, no wheat, no dairy, no soya, no sesame, no nuts, no eggs… Unless of course you can’t eat chickpeas! Substituting sesame: You could try sunflower butter instead of tahini paste. If you do want to make this WITH tahini paste you need to add 1.5 tablespoons. DO NOT BE FOOLED INTO THINKING YOU CAN ADD SESAME OIL… AND IF YOU DO ADD A TINY TINY BIT. I TRIED THIS AND IT’S NOW SESAME CITY. PS. Thank you Hailey of Allergy Adventures for teaching me how to make this! * What are nori flakes? Nori flakes are a type of edible seaweed. They are about a third protein and a third fibre, and contain high proportions of iodine, vitamins A, B, and K, and iron. They also contain sodium, calcium, magnesium, potassium, chlorine, sulfur and phosphorus; the micronutrients include iodine, iron, zinc, copper, selenium, molybdenum, fluoride, manganese, boron, nickel and cobalt. I put them on salads, in soups right at the end and use it instead of salt sometimes. It has a delicous salty tangy flavour and is also great in salad dressings. I buy mine from Goodness Direct (see link in side bar). I hope you enjoy making this simple humous recipe and I’d love to hear any tips of other ingredients you have added to make a twist with the flavour.